This book is about finding one’s soul while healing our culture and our planet. It describes a lifelong process that is a fascinating adventure whose essence the author refers to as Natural Harmony—the mutually beneficial reciprocity woven into the web of life that has allowed life on Earth to endure and evolve over billions of years. We stand at the confluence of two rivers of energy. One features the scientific-production-consumption worldview of the past several hundred years. The other is an emergent stage of consciousness in which the living planet, Gaia, is the center of attention. Will we poison our children with nuclear waste and destabilize life with irresponsible genetic manipulation? Or will we deepen our understanding of the web of life and act on what we learn. 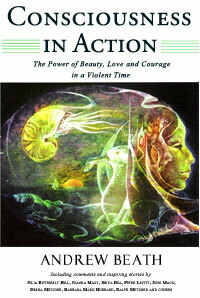 Consciousness in Action presents insights about the evolution of consciousness that Andrew Beath has distilled from decades of social and environmental activism, weaving a tapestry of wisdom that features inspiring stories from numerous progressive leaders. Julia Butterfly Hill, Joanna Macy, Deena Metzger, John Mack, Ralph Metzner and many others offer commentary that elaborates Beath's themes and provides pathways to personal and global transformation. Their focus is on seven attributes of consciousness that they have employed in their activism and that have demonstrated their viability across time and cultures to bring about change. Our perspective, our view of the world, our attitude is physically creating our own destiny and the fate of the Earth. The damage we are causing to the Earth is the impetus for the next step in the evolution of human consciousness. stories of beauty, love and courage that address the mystifying dilemmas facing each of us: Who are we? How did we come to inherit our current circumstance? What can we do to resolve our time of discontent? In some respects this book could be considered a creation myth—one that could only be born of our epoch—in that it defines our purpose as individuals and as a species in different terms than earlier creation myths have done. Its essence is Natural Harmony. Personal healing and deepening are in many respects the same process—and this individual course of action is the first step in social and global change. Guidance for this process is provided by the seven attributes of conscious activism.